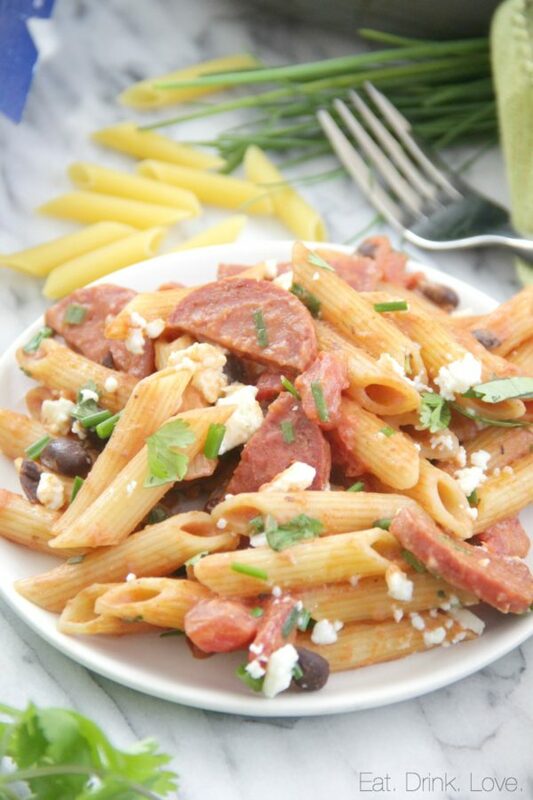 Penne with Chorizo and Creamy Tomato Sauce - Eat. Drink. Love. Hi, I’m Stephanie and I’m a penne pasta addict. No, seriously, I’m always stocking it in my pantry because it’s the perfect versatile pasta that works well in so many dishes. I recently mixed up this delicious fusion recipe that I’m totally crazy about now because it has all of my favorite flavors! 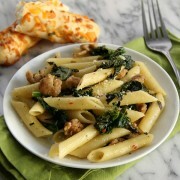 For this dish, I used my go-to Barilla Penne pasta. 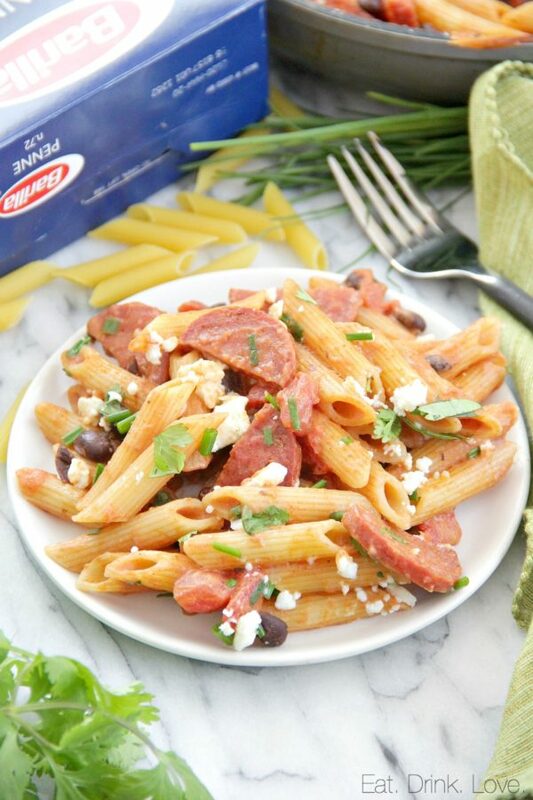 I love Barilla pasta and always reach for it when mixing up new pasta dishes. It cooks perfectly al dente, which is just the way I like it! The sauce for this recipe is truly the best. It’s the perfect fusion of creamy tomato sauce mixed with cumin and chili powder and has the most amazing and unique flavor. I sliced up some chorizo and browned it and then mixed in some black beans for some protein and diced tomatoes. I also added in a good amount of chopped cilantro and chives and then sprinkled some cojita cheese on top for good measure! The flavors in this dish are truly fantastic. It may seem like a lot of ingredients, but the recipe comes together really quickly making for the perfect weeknight dinner in just about 30 minutes! 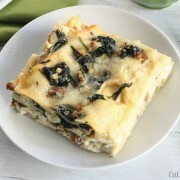 This dish is a great alternative to more traditional pasta dishes for when you are looking to change things up! 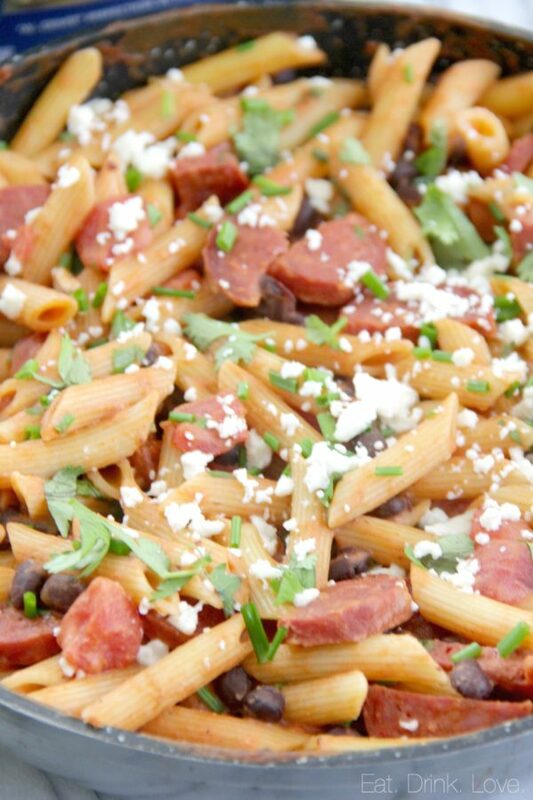 This spanish-inspired pasta dish is made with chorizo, cumin, beans, and crumbled cotija cheese! Bring a pot of water to a boil. Add a couple of pinches of salt. 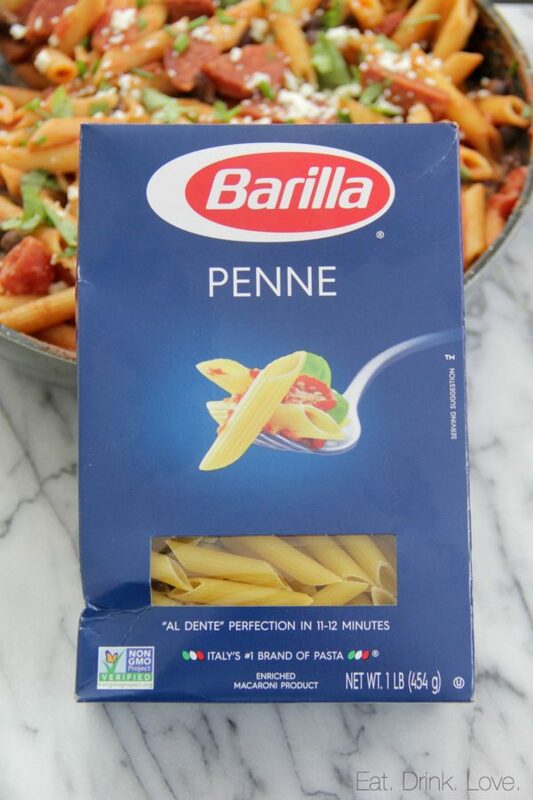 Cook the Barilla Penne according to the package directions, about 9 minutes until al dente. Drain when cooked. While the pasta cooks, heat the olive oil in a large non-stick skillet over medium heat. Add the chorizo and cook until lightly browned, about 2-3 minutes. Turn each slice over and cook for another 2-3 minutes. Transfer the chorizo to a plate and place the skillet back onto the heat and lower the heat to medium-low. Add the garlic and cook for about 3o seconds. Pour in the tomato sauce. Quickly stir in the corn starch with the half and half and then pour in with the tomato sauce. Mix in the chili powder and cumin. Let the sauce start to thicken, stirring occasionally. As as soon as the sauce thickens, add in the beans and diced tomatoes. 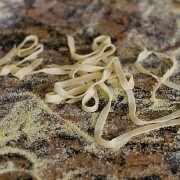 Then add the cooked pasta and chorizo. Toss until everything is coated in the sauce. Mix in the chives and cilantro. Season with salt to taste. Garnish with the crumbled cotija cheese. Serve. 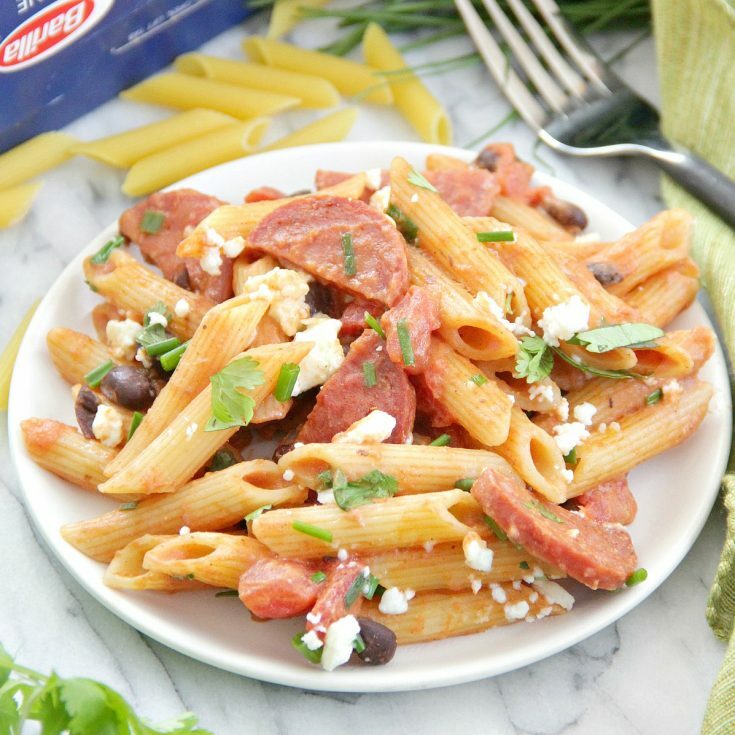 Barilla is also giving away thousands of prizes including gift cards and Barilla products so be sure to check them out here because everyone wins something! You can also get some great coupons here! I purchase my Barilla pasta at my local Pavillions in the pasta aisle. 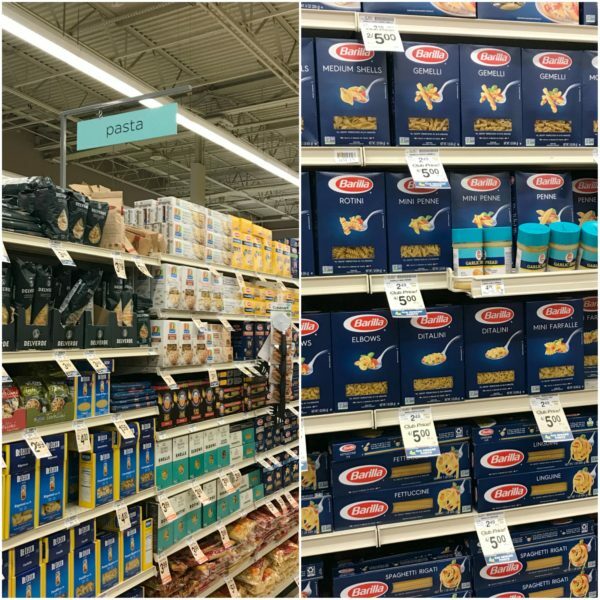 They always have a great selection of Barilla!